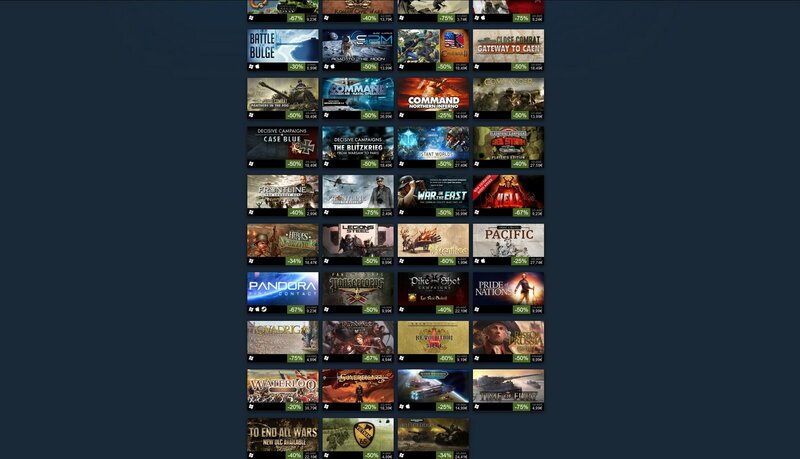 Bonne nouvelle pour les wargamers, Slitherine vient d’annoncer une première opération promotionnelle dans le cadre des biens connues promotions de milieu de semaine sur Steam. C’est l’occasion pour qui n’a pas un gros budget et n’a pas envie d’attendre les traditionnelles promos de Noël de pouvoir s’offrir de nombreux bons wargames et jeux de stratégie à moindre prix. Soit concrètement en bénéficiant de réductions allant de -20 à -75 %, dont vous pouvez profiter jusqu’à ce vendredi 26 février prochain en fin de journée (10 AM PST). ou enfin Warhammer 40 000 Armageddon et 4 de ses DLC. Epsom, UK – February 23, 2016. Since Panzer Corps was Greenlit on Steam in December 2013, Slitherine has been teaming up with the popular digital platform to release many strategy games. Still faithful to its traditional distribution channels through its own sites, Slitherine is always working to bring deep and exciting wargames to as many gamers as possible. Today, the collaboration between the two companies reaches a new level, with the launch of the first Steam Midweek Madness devoted to Slitherine! From February 23 (10am Pacific Time) to February 26 (10am Pacific Time), many of the games published by Slitherine are available at a bargain price. Among the marvelous opportunities that can be seized are all-time classics like Panzer Corps Collection at 63% off, Gary Grigsby’s War in the East, Ageod’s Civil War 2 and Close Combat: Gateway to Caen at 50% off. Also for the very first time, Battle Academy 2 (77 Metascore / 91% positive user reviews on Steam) gets a unique 75% discount, along with its Kursk expansion! Fans of fantasy and sci-fi games will also be excited to know that freshly-updated Pandora: First Contact is available at 67% off and that we are making a discount on Warhammer 40,000: Armageddon and all of its DLCs for the whole period of the Midweek Madness! It’s just the right moment to jump into our deep strategy world!